I land in Telluride, Colorado, late sunny February afternoon. Is an unusual wheatear for this season. Accompanying me my wife Vanessa, son Lorenzo and my assistant Camilla Meloni. 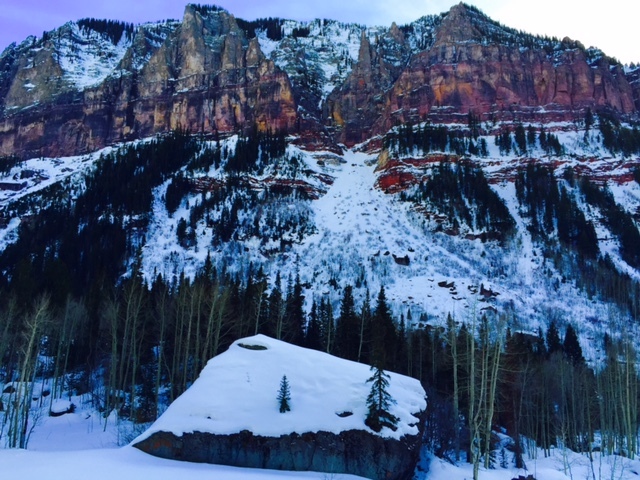 Telluride is a well known skiing destination chosen by wealthy Americans for their winter fun, like and “American Cortina”. 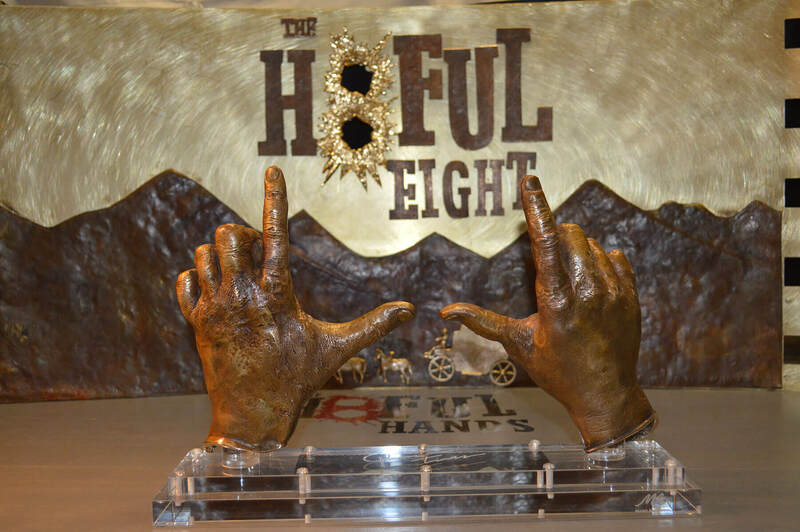 This year was also chosen by Quentin Tarantino for the production of his western movie THE HATEFUL EIGHT, the story will soon be known by everyone but now is still quite the secret. It will be 8 characters that find shelter during a storm. Between the snowy mountains and the freezing cold, a typical Tarantino movie. It might just be his most important western movie. I really hope so, that’s why we came all the way here due to the invitation to make the sculpture of his hand. We came during the shooting of the movie, what a privilege, considering that the set is locked down. We spend our first day relaxing between a bar in downtown Telluride (Telluride is made of 3 parallel streets, just like wild west towns) and surrounding snowy areas, picturesque sceneries that make me think of back in the day when this land was filled with cowboys. The colors of this land are stunning, a true wonder of nature. We see an actual wolf walking right outside of the woods, hunting small preys right in front of our eyes, Lorenzo is amazed. Me? I’m a little worried about the proximity of this massive wolf; I enjoy the show very carefully. Our appointment with Tarantino is in the early morning, on set is freezing and since we are going to be sending long hours on set, we are advised to bring warm clothes. We will be surrounded by the Colorado Mountains. So after a high calorie breakfast we leave with a map in our hands trying to find the road to the movie set. After almost one hour on a dirt road and a breathtaking panorama we see a small snowy valley and the production trailers, we have arrived. After being “checked in” we are asked to leave all cameras and cellphones in the car. We are escorted to a white tent, heated by a large plastic tube that blows hot air. It’s sunny but the temperature it’s 5 Fahrenheit. 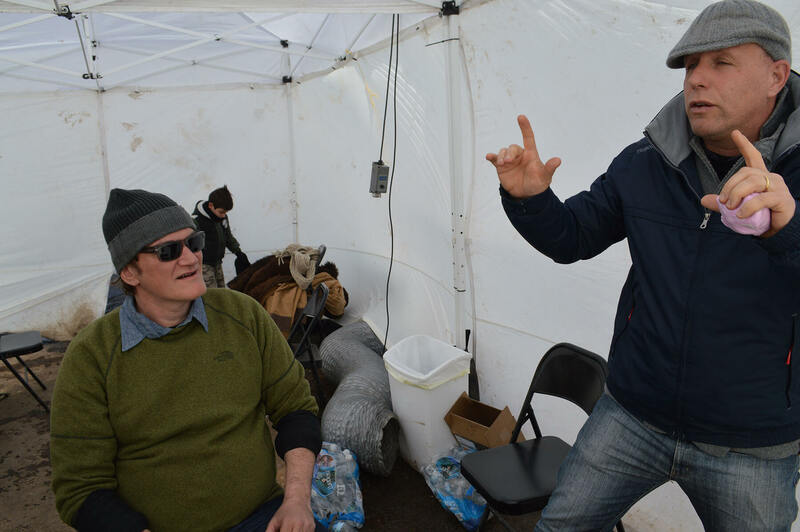 The tent is located right behind the set in which the actors and Mr. Tarantino are shooting. We wait a few minutes and then we are taken over to set, its’ beautiful, original and antique. It seems like we went back in time. All the actors are wearing western attire, they get mixed up with the crew and there is an organized chaos. Something weird happened just about now, on the director’s chair we see Tarantino from behind. He gets up and walks towards us, with his hands in the air and a big smile he welcomes me saying “welcome Maestro”. This moment stays with me like an important memory, not because he called me Maestro (I know I’m not one), but because with that word Tarantino wanted to pay homage to me being Italian, like he was acknowledging that sculptors come from Italy. This is an Italian strength that sometimes we don’t even take in consideration and we don’t value it. We are recognized even before showing what we are made of; we are artists. Our story says it all, that’s why Tarantino’s homage to Dante was actually one to Italy and this, was a big satisfaction off the bat. Break for the actors and our job begins. Discussing with Tarantino we find the perfect position to make the hand sculpture. While I’m focused placing the silicone on the hand I get an idea, I hold on before revealing it. I think to myself if it’s something that could annoy such great director like him. But this is the only opportunity I have and so I go for it. I start by saying: “I would like to propose an idea, but let me know if is something that doesn’t make you comfortable”, I begin, “I know thru a press statement that in Los Angeles there will always be a movie theater ready to show movies made on film, this is kind of the philosophy behind my project Mano Artigina, things made by hand”, this movie is made by hand, old school, to give the same feeling as the originals with the craftsmanship of the perfect technique. “So, why don’t we make a sculpture with the hands of the lead actors in the movie, and thru their hands we interpret the nature of their characters; something like a totem made of hands, one on top or near the other, all together they tell the story”. “What do you think?” Tarantino looks at me with a serious face; his hands are submerged in silicone. A smile appears on his face and says “Amazing, fantastic!” I take courage and I keep going: “I think this might be the first time in the history of cinema that a sculpture is produced in symbiosis with the making of a movie”. He’s glowing; anything I say doesn’t matter anymore, the idea being shaped in his head. Calls his assistant, looks at me as asks: “So we begin now? I’ll call Samuel L. Jackson who’s resting right now so we can get his mold now, also today Tim Roth and Kurt Russell are here and also..” I stop him right there to let him know that I don’t have enough material to do everything today, I’ll try to get this ones done, I’m so happy but maybe he’s even happier than me. Just like this the idea begins. 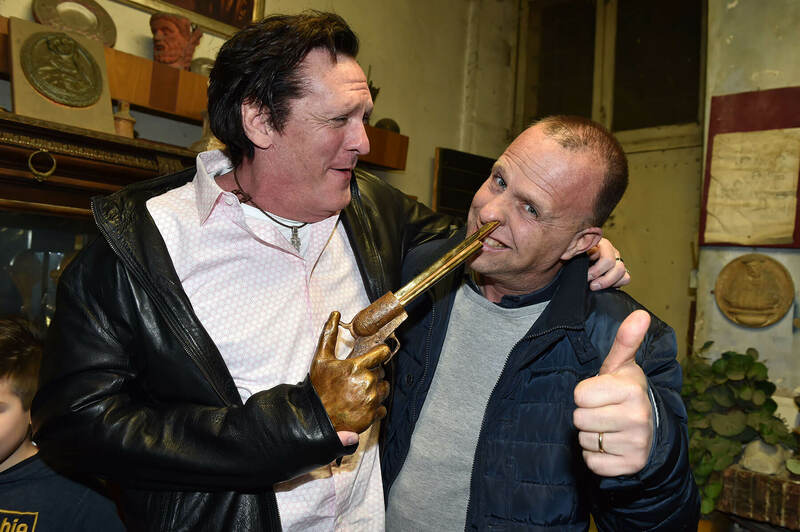 It will be a unique and original sculpture, it will be thrilling to make it, I will have to come back on Tarantino’s set in a month, get the molds of the missing actors: Bruce Dern, Michael Madsen, Jennifer Leigh, Walton Goggins; they will complete the sculpture, THE HATEFUL EIGHT. I already have it in my head and Tarantino, after my tale, is starting to imagine it. Our day in Telluride is over, for now. We go back to the hotel, exhausted but happy, with the molds of Tarantino, Samuel L. Jackson and Kurt Russell. The most important thing is that we started an idea, a beautiful one and we don’t know where is going to take us, but it will give us many satisfactions and above all we’ll be happy to accomplish it and share the emotion. This is what counts the most for me, doing the work with passion and happiness. Everything else is all success! 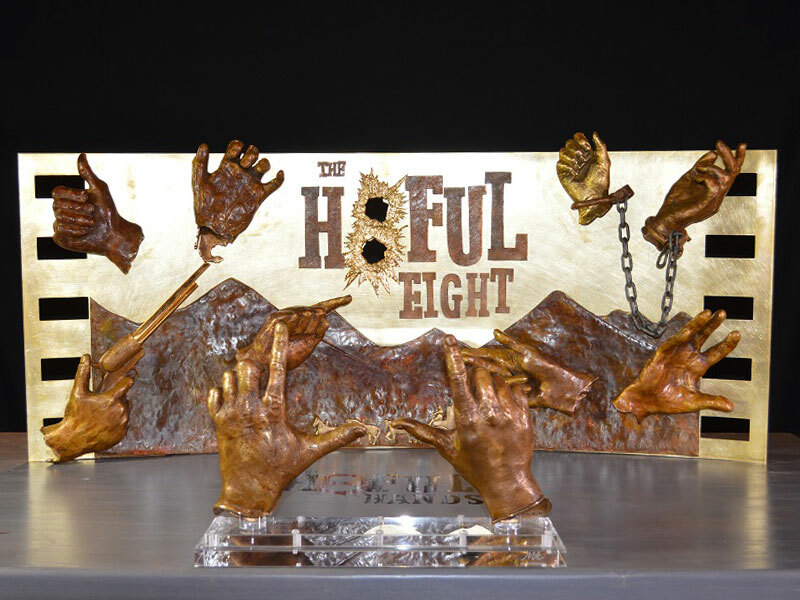 Mano Artigiana &amp; The Hateful Eight. My idea is to make more or less famous hands and to relate them to each other in an exhibit of Sculpture Hands, where the diversity of them, is an example of the ability and industriousness of the hand.